Technology creation has been a key driving force for many breakthrough innovations over the past several centuries, be it printing press, electric bulb or PC. However, the same passion that creates technology can also blind the innovator in seeing the real need of the customer he is trying to fulfil. 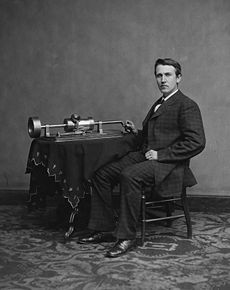 Thomas Edison took the idea of phonograph from concept to cash. However, Edison’s adamant view that “every problem has a technology solution” led to the downfall of his phonograph business. We call this view – that every problem has a technology solution – Edison Syndrome. Let’s see how Edison Syndrome hurt Edison. Thomas Edison invented phonograph in 1877. However, for the next few years, he decided to focus on commercializing electricity and the practical lamp. In the late 1890s, Edison went back to phonograph after making many improvements to his original invention. He founded National Phonograph Company and by 1904 sold over 113,000 talking machines and seven million records. This meant a market share of more than 60%. By the end of 1920s it came down to 2%. How did this happen? Edison’s phonograph was rivalled by the Victor’s Talking Machine Company. Victor made technical improvements to the machine as well. However, Victor also focused on packaging – creating an enclosed horn in a handsome wooden cabinet. According to a historian “(Victor) was to make the phonograph for the first time a piece of furniture.” Banker’s panic in 1907 impacted both Edison and Victor. However, Victor’s recovered much faster. What is the moral of the story? Technology creation and improvement is a great source of innovation. However, not every customer need requires a new technology for fulfilling it. Sometimes the differentiation lies in designing a superior customer experience, the way Victor did by creating famous artist labels. Steve Jobs certainly understood this well when he launched iPod a hundred years later. DeGraaf, Leonard, “Confronting the mass market: Thomas Edison and the entertainment phonograph”, Business and Economic history, Fall 1995, pp 88-96.